Capital Refractories has introduced their patented Multicast system for use in ladles with a re-usable lining. This utilises a re-usable isostatically pressed graphitised alumina stopper rod, which typically lasts a minimum of around 10 fills - depending on alloy and temperature. The stopper-rod requires setting only once, resulting in a considerable saving in labour. A disposable fibre gasket (patented) is employed to prevent sticking and leaking. 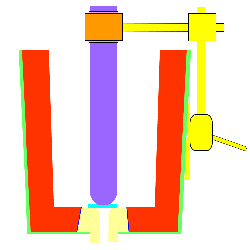 Figure 1 compares the two ladle systems. The Multicast system requires the use of a re-usable chemically bonded high alumina nozzle. The deterioration of the nozzle means that typically, depending on alloy, a nozzle with the Multicast system can be expected to last a minimum of 5 fills before it needs replacing. At this time, the selection of the nozzle bore size will be influenced, where possible, by the planned castings during the lifetime of the nozzle. 1、Reduction in labour cost, i.e. no need to re-set stopper and nozzle after each cast. 2、Reduction in cost of consumables, i.e. the graphitized mono-block stopper will last 10 taps and the nozzle will last around 5 taps. 3、Reduction in the cost of ladle lining, i.e. monolithic ladle lining with reduced thermal cycling reduces maintenance and extends the ladle lining life. 4、Reduction in patching and repair materials due to high strength low cement castable linings. Also reverse taper nozzle requires virtually no fixing cement. 5、Reduction in pre-heat costs since ladle can be used continuously. 6、Greater ladle availability due to one ladle in use continuously thereby reducing ladle inventory. 7、Reduction in waste costs due to extended life of refractories. 8、Reduction in scrap rates due to reduced refractory inclusion, hotter ladle and more consistent metal stream.